Most of the tools and equipment you’ll need for freezing or drying foods (except an electric dehydrator) are probably waiting for you in your kitchen. These items will make your preserving tasks more efficient. The faster you process your fresh ingredients, the better the quality and flavor of your final product. A freezer: Usually, the freezer attached to your refrigerator is large enough for freezing food. But if you’re serious about freezing large quantities of food, you may want to invest in a separate freezer unit. Rigid containers: These containers can be made of plastic or glass. Use only containers approved for the cold temperatures of a freezer. Plastic containers should be nonporous and thick enough to keep out odors and dry air in the freezer. Glass containers need to be treated to endure the low temperature of a freezer and strong enough to resist cracking under the pressure of expanding food during the freezing process. Freezer bags: Use bags made for freezing in sizes compatible with the amount of your food. Freezer paper and wraps: This laminated paper protects your food from freezer burn, which results when air comes in contact with your food while it’s in the freezer. Tape this paper to keep the wrap tightly sealed. Heavy-duty aluminum foil is another great freezer wrap and requires no taping. 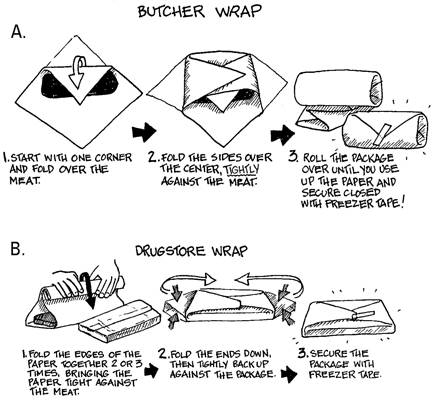 The following illustration demonstrates two freezer paper wrapping techniques. For extra protection against freezer damage, wrap food items in foil and place them in a freezer bag. 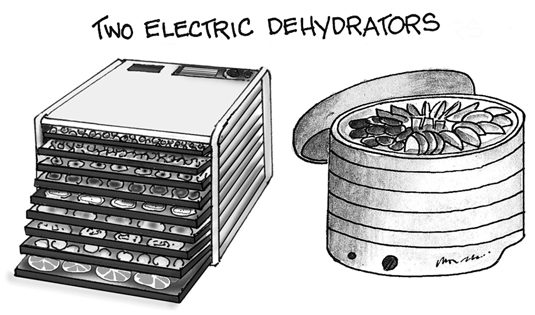 An electric dehydrator: This machine dries your food in an enclosed chamber while it circulates warm air around your food. Two examples of a dehydrator appear below. A conventional oven: If your oven maintains a low temperature and you can stand to be without it for up to 24 hours, use it for drying before making the investment in an electric food dehydrator. Oven thermometer: An oven thermometer tells you if your oven temperature is low enough to dry your food without cooking it. Trays and racks: These are used for holding your food while it’s drying. They’re included with an electric dehydrator. For oven-drying, use mesh-covered frames or baking sheets. For sun-drying, clean screens are necessary, along with clean cheesecloth to keep hungry bugs off the food as it dries.